September 2019 admissions - Nursery/preschool only. Parents are invited to visit the school to meet the nursery teacher, view the setting and understand the admissions process for September 2019 starters. At Trinity, we have a 30 place Nursery, providing the Early Years Foundation Stage for 26 three and four year olds and 4 two year olds. 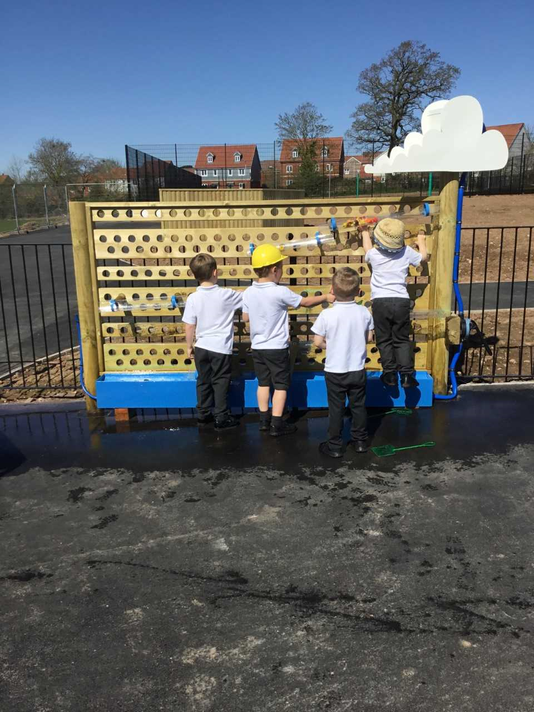 The Nursery is part of an exciting Foundation Unit, which is purpose built for Nursery and Reception aged children, where the provision is of the highest quality. The Nursery is lead by a fully-qualified Early Years Teacher, and a highly experienced Teaching Assistant. 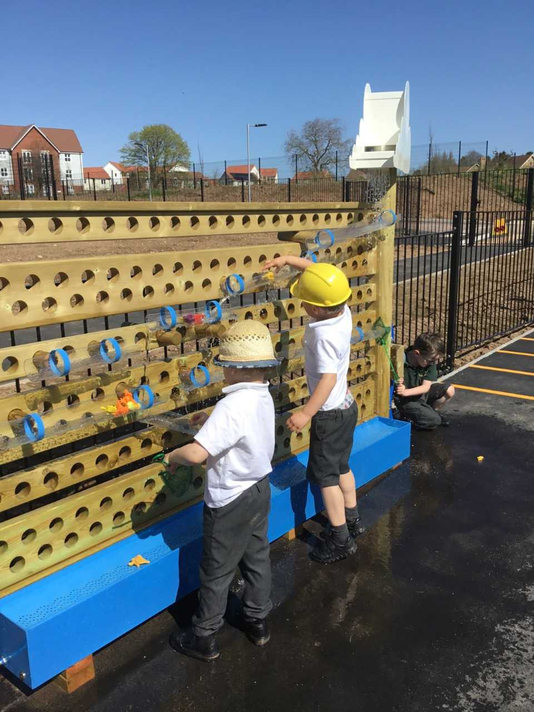 There is a brand new, spacious, secure outdoor learning environment where children can use large equipment and wheeled toys and they benefit from structured play and learning activities throughout the year. 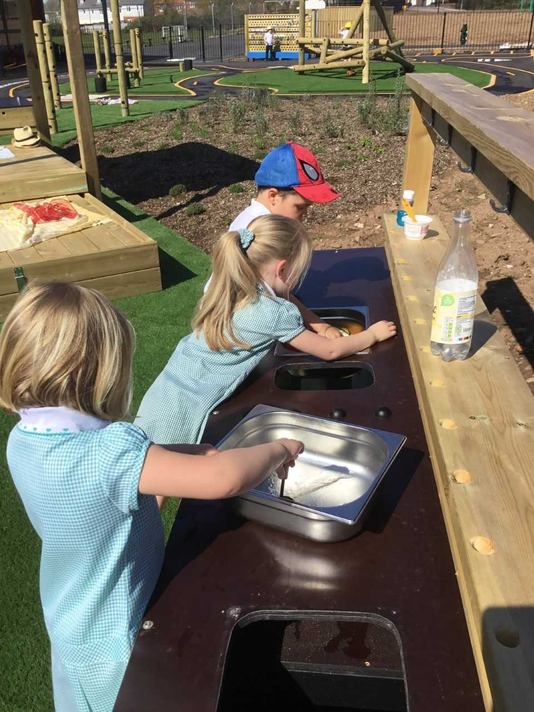 There is a grassed area with a mud kitchen and safe access to the school grounds which includes an orchard, forest school, grassy banks, hedges and a fenced pond. Indoors, the area is carefully planned to accommodate the interests and needs of young children with a Home Corner, soft furnishings, a quiet space for reading and resting, a snack and self service drinks area as well as many interesting and creative activities. Nursery children have opportunities to take part in school activities and special assemblies or celebrations, where appropriate. They use the school hall for some of their physical development sessions and join the main school at lunch time where they can interact with older children. 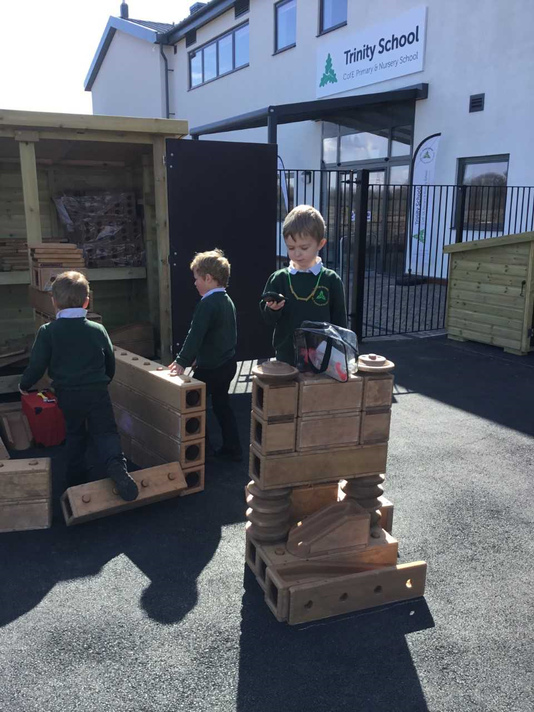 In this way, nursery children become familiar with the building, with other adults in the school and with some of our expectations, all of which greatly assist transition if they continue at the school into Reception class. All our children learn through active, engaging play using familiar toys and other objects. We do a lot of singing and frequently repeat favourite songs, nursery rhymes and stories using actions and pictures. This helps all our children learn to communicate effectively which is essential for their development and learning. Children who stay for the morning session or stay all day will need to bring a packed lunch or purchase an optional hot dinner provided by our on site caterers, Fresha. Meals are purchased via School Gateway at £2 per meal. Those children attending for only half a day will not eat lunch at school. You are able to choose any combination that suits you, subject to availability, and for those who are not eligible for government funding, additional sessions may be bought at a cost of £13.00 per session. If you wish to buy extra sessions, you need to commit to a term at a time, and pay monthly in advance. We are also able to offer extended hours child care, at an extra charge. This means that our school is able to provide quality child care linked to nursery hours to enable your child to be in school from 7.30am. to 6.00p.m. The breakfast club is available for children aged 3 years and up and starts at 7:30. This is charged at £3.50 per child. The after school is also available for children aged 3 years and up and starts at 15:15 and runs through till 18:00. This is charged at £8:50 per child. Parents/carers wishing to apply for a place for their child in the nursery need to read the admissions policy and complete an application form (available below) and return it to the school. Parents may take up their 15 or 30 of hours free entitlement from the term after their child's 3rd birthday or purchase nursery hours during the term before. A few weeks before your child is due to start in the nursery we will aim to arrange a Stay and Play visit at school and/or a home visit with your child. At this time we will find out about your child, show you around our setting and confirm the date to start in the class. We do expect a parent or carer to be prepared to stay with their child for the first few sessions, until they feel secure and happy to be left. We find that this process of Stay and Play then coming to school with a family member, usually enables children to have a smooth transition into the nursery class. 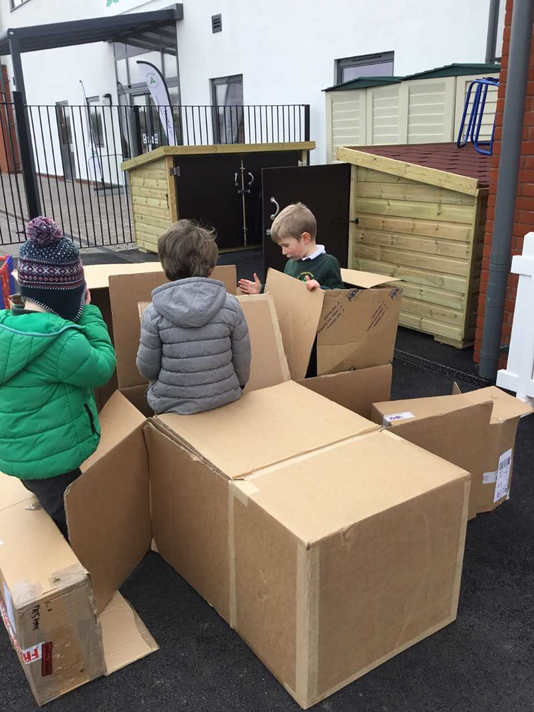 Our inside environment is bright and spacious with learning through play at its heart. 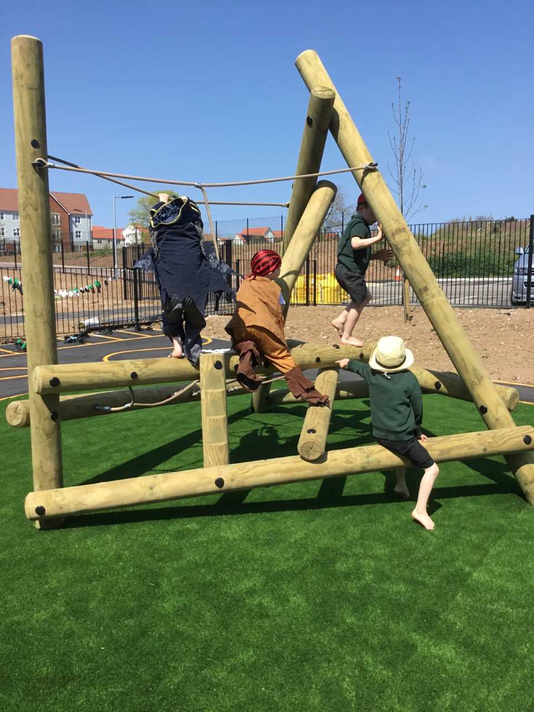 All areas are designed to encourage children to be independent, active learners. We have a beautiful landscaped garden and play area, perfect for enthusing young imaginations. 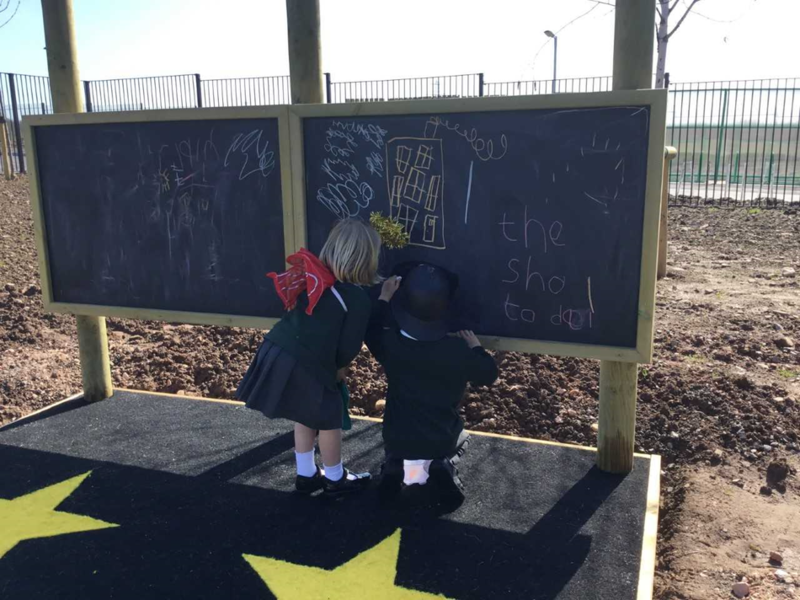 There is also a large covered outdoor play area so come rain or shine we can be outside playing and learning. Our aim at Trinity Nursery is to place children and their families at the centre of everything we do. Within a safe and stimulating environment, we build trusting relationships that enable children to flourish. As adults we take the time to get to know each child and tailor the curriculum to meet their needs and interests. We fully understand that starting Nursery can be a daunting time for both children and adults so we place great importance on working together with families to ensure the best possible transition. It is these characteristics which enable children to become life long learners. Our stimulating learning environment ensures that every thing from creativity, to maths and language skills and children’s personal, social and emotional needs are being met. Hi, I'm Laura the Nursery Teacher. I feel very privileged to be able to work with such a highly skilled and experienced team. As the Nursery Teacher I coordinate and plan learning in the unit. I am an Early Years Specialist Teacher with 9 years of teaching experience in the Midlands and the North of England. I am passionate about providing young children with experiences that will develop and nurture a love of learning. It is not a requirement that Nursery children wear the school uniform, however if you would like your child to wear the school jumper that would be great. Our main priority is comfort so children are encouraged to wear black or grey leggings, joggers, skirts, dresses (this can be the green gingham dress in summer) and comfortable Velcro shoes. You will need to provide a sensible coat but not wetsuits or wellies as these are provided by us. Children are also invited to bring in a pair of slippers that they can wear indoors. Again, this is optional. Please could you take a moment to click on the following link and read the information regarding the Early Years Pupil Premium funding. If you think your child may be entitled to this, please feel free to apply yourself, however this is something we will be discussing on your home visits in September.